When we received the GroBags I loved the packaging and they looked good before I’d even removed them. When I took them out of the packaging the free nursery thermometer was a nice little extra. 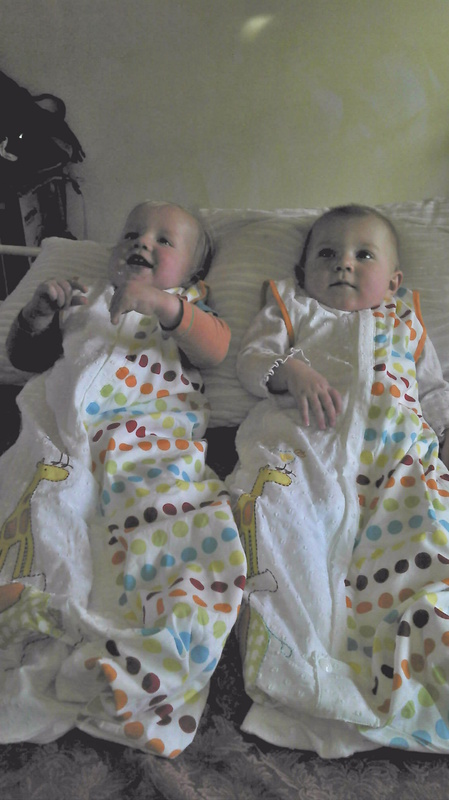 The Dotty Day out is a fresh bright design that looks great, and the twins looked lovely when they were all cleaned and bathed and zipped into their GroBags ready for bed. Unfortunately this picture may not capture their complete gorgeousness, trying to get them to stay still was a near impossibility and resulted in Robbie knocking his sister off our bed. All rather stressful just before bed but Daisy was ok as she is a tough little cookie 🙂 she has to be with Rough em up Robbie as her twin. The GroBags have been through the wash on many occasions and have come out a bit crinkled up – this could be because we are busy busy people and we cannot wait for the tumble dryer to be finished. We leave them to sit sometimes, shame on us. The crinkles fall out quickly after a night sleeping in them. I love their grobags! We were given one as a present and Theo is about to outgrow… But they’re so soft. I wish they made adult versions! What a well written review!